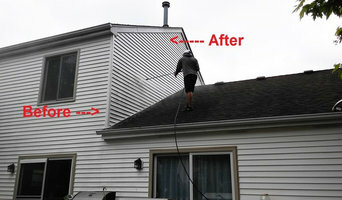 Aetna Maintenance Masters Inc provides safe and efficient gutter and downspout cleaning services to the Mequon, WI area. We take pride in our quality workmanship and customer service. Count on our dependable team to be there when you need us. Contact Aetna Maintenance Masters Inc today at 262-238-8939 for a FREE estimate! RPW ProWash is a family owned company specializing in Certified Soft Wash Roof Cleaning, Commercial Hood Cleaning and Complete Wood Restoration. We are committed to more than just satisfied customers, we’re looking to create lifelong clients. Give us a call and let us come give you a free no obligation estimate. At RPW ProWash we use the SoftWash System that has safely cleaned over 50,000 roofs. Our cleaning lasts four to six times longer than pressure washing. We will make your roof look brand new! RPW ProWash also specializes in wood restoration. We strip, brighten, sand smooth and seal your outdoor wood structures such as decks, fences, gazebos, etc. making them look Better Than New! What do Waukesha, WI exterior cleaners do? Find exterior cleaners in Waukesha, WI on Houzz. Search the Professionals section for Waukesha, WI exterior cleaners or browse photos of completed projects and look for the exterior maintenance professional’s contact information.